I have a vase that was my mothers. It is a blue green art deco style piece stamped on the bottom with Chameleon Ware, Clews & Co Ltd and Tunstall. 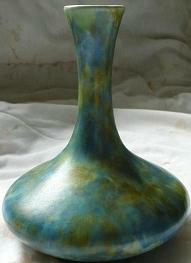 Can anyone tell me more about Clews & Co, and the history and value of this art deco vase? Your vase is by George Clews & Co Ltd, who operated from Brownhills Pottery in Tunstall, Staffordshire and produced earthenware vessels from c1906 to c1961. 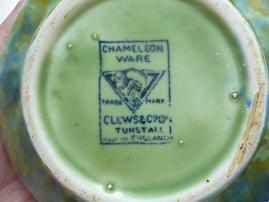 The mark on the base confirms it is Chameleon Ware and it was potted sometime after 1935. George Clews Co. Ltd. was first registered in 1906 as Jet Manufacturers. The Jet connection came from their use of a red clay usually dipped in a cobalt glaze, which when fired in the kiln produced a jet black vessel. Main Clews production was teapots including the famous Cube teapot. It was produced under license for the Cunard Line and the company was run by George Clew’s son Percy. It is difficult to estimate the value of the vase without handling the piece and recent auction values are rather elusive. However if you search eBay for ‘Chameleon Ware Vase’you will find a small selection of various but mainly Art Deco styles with asking prices ranging from as high as £225 GBP to around a low of £35 GBP.